For Crafty Tuesday today I only have one thing to show you. 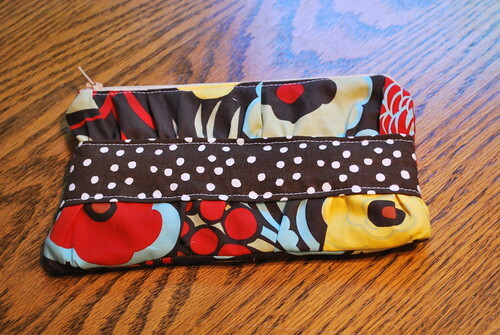 I made my mom a gathered ruffle zipper pouch using this tutorial. Then I slipped a gift card inside. I did manage to clean off my craft table and cut the fabric for the kid's capes, but there was not much sewing going on this week. I have vowed to spend an hour every day working on the various projects I need to get done. Hopefully next week I will have a little bit more to share. OH that is ADORABLE! What a great way to give a gift card, too! I have vowed to do the 1 hour a day thing, too. J. is out of town so I have lots of hours at night to sew guilt-free, but instead? I tore down the wallpaper in the girls' bathroom. It is a sickness, I think. That is a good vow...I need to do that, too! This is just too cute. I think I could even follow the steps. Thanks for the link to the tutorial! I like the material you used too.